General Electric (or McKinsey) matrix uses market attractiveness as not merely the growth rate of sales of the product, but as a compound variable dependent on different factors influencing the future profitability of the business sector. 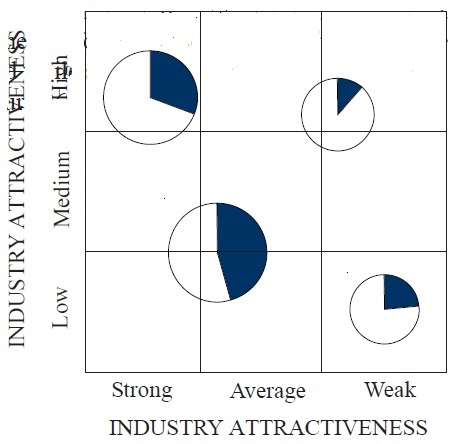 These different factors are either subjectively judged or objectively computed on the basis of certain weightages, to arrive at the Industry Attractiveness Index. The Index is thus based on a thorough environmental assessment influencing the sector profitability. Factors determining Competitive Position of the Company as with Industry attractiveness, the Competitive Position of the Company is analysed not only in terms of company’s market share, but also in terms of other factors often appearing in the Strength and Weakness analysis of the company. Thus, product quality, technological and managerial excellence, industrial relations etc. are also incorporated besides market share and plant capacity. The Industry Attractiveness Index is then plotted along the vertical axis and divided into low, medium and high sectors. Correspondingly, the Competitive Position is plotted along the Horizontal axis divided into Strong, Average and Weak segments. For each business in the portfolio, a circle denoting the size of the industry is shown in the 3 x 3 matrix grid while shaded portion corresponds to the company’s market share as shown in Figure-1. GE rates each of its businesses every year on such a framework. If Industry’s Attractiveness as well as GE’s Competitive Position is low, a no-growth red stoplight strategy is adopted. Thus, GE expects to generate earnings but does not plan for any additional investments in this business. If for a business the Industry Attractiveness is medium and GE’s Competitive Position is high, a growth green stoplight strategy is evolved for further investment. But if a business has high Industry Attractiveness Index and low GE’s Competitive Position, this is branded as yellow stoplight business that may be moved either to growth or no growth category. Such grids are developed at different managerial levels. The final strategic decisions are made by GE’s Corporate Policy Committee comprising the Chairman, the Vice-Chairman and Vice-Presidents of Operational areas, including finance.